Somethings in life take a little preparation. Like going on a first date, decorating for the holidays, and applying for a mortgage. Imagine the outcome if you did zero prep work for the first two occasions? So why do so many people miss the obvious fact that applying for a mortgage has its own set of behind-the-scenes preparations? Yes, you could find a house and connect to a mortgage company on the spur of the moment act of bravado. But are you sure about what the lender will tell you? Do you already know your comfort zone for monthly payments? How about what a stranger would say if they looked at your bank statements and your credit report? More than likely you don’t know what a lender would think about your financials. You may not have paid all that close of attention to it lately, but it’s not like you don’t know what’s going on under your money-hood. But maybe you could know more, or tidy up a bit. If you think you’re almost ready to buy a home, take – ideally – six to twelve months before starting to go through the following steps. You may have heard the saying “house rich and cash poor.” When someone finds the home of their dreams, but they can’t afford it right now, so they buy it anyway and become house rich and cash poor. Once you’re in that situation, it’s easy to get into a financial freefall as life’s little hiccups can be expensive at times. Start out by taking a hard look at how much money you spend versus how much you earn. If you don’t usually use a budget, you can review the last three months of your spending habits to create some categories and see where your money goes. Keep your list focused on things you have to pay for and exclude the extras, like entertaining, traveling, and buying that SUP board. Once you have that number, add in your current rent and take the total and divide it by how much money you make, before taxes are deducted, every month. This is the percentage of your gross income you need to spend on expenses every month. A good tool you can use is this one by Bankrate. Everywhere you look, you’ll see different ratios suggested for the best plan to cap your expenses and mortgage payment. Lenders will use a total ratio of between 43%-45%. Is that number going to be comfortable for you? It’s essential for you to calculate what will work for you, as long as you know lenders aren’t typically willing to exceed these percentages. Once you know your number, you can use that to calculate the price range of home you can purchase. Knowing this number will lead you to the next step. Having the price range set for the home you’d like to purchase is the first step in calculating how much you’ll need for your down payment and closing costs. And you have several options available for a down payment besides the standard twenty percent. You can make a down payment of as little as three percent of the purchase price, as long as the loan amount remains under the conforming loan limit of $453,100 set by the Federal Housing Finance Agency (FHFA) for 2018. You can also make a five, ten, and fifteen percent down payment, based on your purchase price. Keep in mind; if you put less than a twenty percent down payment, you may need to pay a monthly mortgage insurance premium on top of your payment. Or you can take a slightly higher interest rate and opt for Lender Paid Mortgage Insurance (LPMI), or get an 80/10/10 loan. Once you decide your target down payment percentage, take an assessment of your current savings picture and calculate how close you are from your target number. Once you know the amount you still need to save, you’ll need to add in the estimated closing costs and prepaid expenses. Escrow accounts (also called impound accounts) are where lenders collect one month’s worth of your property taxes and homeowners insurance premium so they can pay those annual expenses on your behalf. If you’re required to have one, you’ll add that amount to your monthly mortgage payment, send it all in, and the lender will apply the funds appropriately. The added expense at the time you complete your home purchase is called “funding the escrow account.” This includes some months of property taxes and homeowner’s insurance premium. When you apply for a loan, the lender will give you a detailed breakdown of all these items, including the closing and prepaid costs, in the form of a Loan Estimate. But you’ll need to get an estimated number now to add to your savings goal. There are several calculators online for estimating closing and prepaid costs, along with potential escrow account costs, and many overestimate what you will need. This is what you want so that you won’t be caught short when you apply for the loan. Not having enough money for your down payment and these expenses may cause a lender to decline a loan application. While you’re saving, create another savings goal that should include possible expenses related to purchasing a home. You may need to have inspections done on a property you want to buy, for instance, on the roof, or a pool, or a pest inspection. Don’t forget to account for moving expenses and immediate special purchases you may need to make for your new home. Your savings goals can be the one thing that dictates how soon you will be able to buy a home, but don’t stop going through the steps to get your finances ready. You can get a free credit report once a year from all three of the credit bureaus by going to annualcreditreport.com. Accessing your credit won’t give you the credit scores a mortgage lender will use when you apply for a loan, but it will let you see if there’s anything wrong or strange on your report. If something shows up that shouldn’t be there, the sooner you take action to get things corrected the better. It’s also the time to stop making major purchases and opening new credit cards. New credit will lower your score for six to twelve months, and that may not be enough time to have your scores at their highest before you apply for the mortgage. 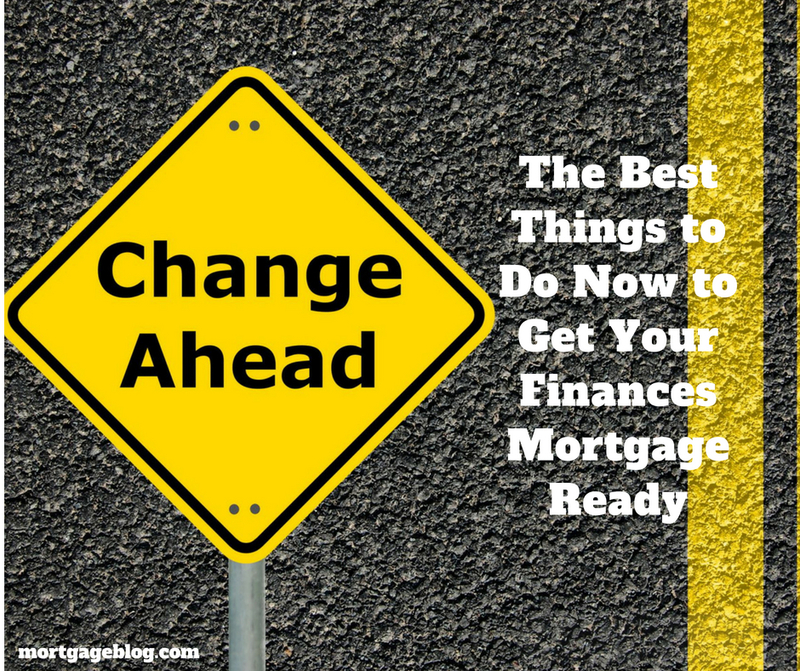 Some things you might usually do in life, regarding your finances, may be a problem when you apply for a mortgage. For instance, you may have several different accounts including checking, savings, and investment accounts. Shuffling money back and forth between your accounts will create a paper trail nightmare when you’re in the process of getting a mortgage. Try to curtail this activity a few months before applying. Also, make sure you’ve made all tax payments due for past tax years. Tax payment plans are viewed unfavorably in the mortgage approval process, and they add to your debt burden when you’re trying to qualify for a loan. Finally, it won’t hurt to shorten your gift wish list for birthdays and holidays to one thing: cash for your new home. If you do have gifts from relatives, make sure you document all you’ve received so that you can disclose this when you apply. The same is true for any large gifts toward your home purchase. Mortgage guidelines allow you to accept gifts of funds from immediate family members and your lender will help you document this. Getting your finances in the best condition well before you apply for a mortgage, or even shop for a home will eliminate much of the typical stress from the process. If you have your money together and there are no surprises on your credit report, take the final critical step of being fully underwritten before you make an offer on a home. Now you’re ready to compete for the home you’re going to love.